14kt white gold pair of dangle fashion earrings featuring natural Garnet drops suspended from Diamond posts. Each earring contains five round brilliant Diamonds with a triangular design as the post and two bezel mounted Diamonds from which the Garnet drops are suspended. 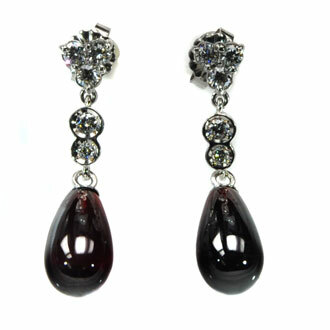 The total weight of the Garnets is 12.33ct and the total weight of the Diamonds is .40ct (for the pair). Custom designed by Jorge Adeler.